Top: H&M. Skirt: Forever21. Belt: J Crew. Shoes and Bag: Anthropologie. Sunglasses: Gap. 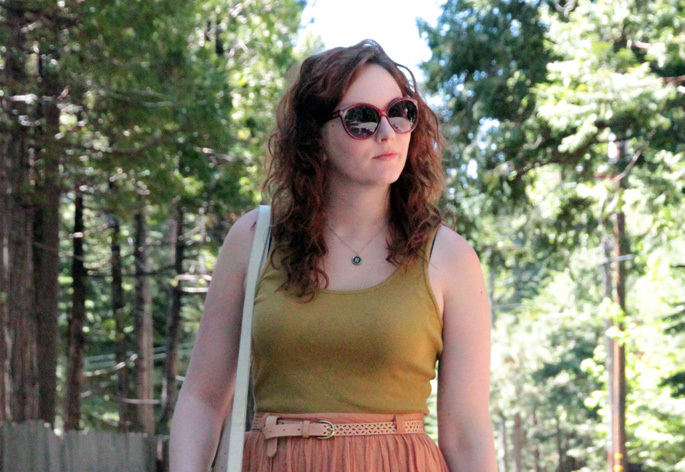 We don’t get a whole lot of hot summer weather in San Francisco (I’m not complaining, I generally enjoy the perpetual autumn), but last weekend while I was in Tahoe City I took full advantage of the warmer temps and kept things simple and summery in the outfit department. It was a nice change to be able to walk around outside without a cardigan and get a little sun on my shoulders. What’s your go-to summer outfit these days? what a perfect summer outfit! i tend to throw on light, airy dresses when the weather warms up! love the location of these photos! Seriously wasn’t the weather just perfect over the weekend/! It was so nice to be able to walk around in shorts and tanks! 🙂 Love those sandals!